As a writer, you will probably are always thinking of great content to retain traffic and boost engagement. You will also get the days when nothing seems to be flowing and hit the famous writers road block.I wrote this post to help existing blogs with new ideas, but if you have a chronic illness and don’t have a blog, don’t worry… These ideas can be a great starting point for you to start one up – even like, me as a hobby. I have made the topics quite generic but you could replace ‘chronic illness’ with your specific illness. I have also broken the ideas down into sections, to try and help you find what interests you to write about easily. The most important thing to remember is even if another chronic illness blogger has covered one of these topics, it doesn’t mean you can’t. However, you should not directly copy another bloggers content. I hope this posts gives you some inspiration. 47. Things to consider before deciding to go to Uni with a chronic illness. 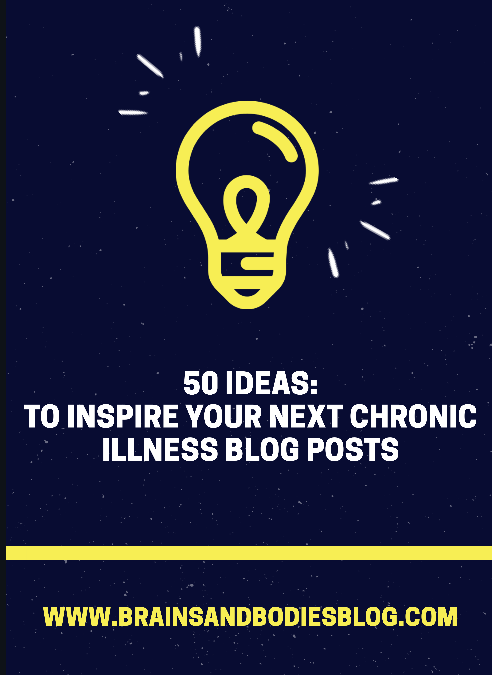 I would love if you shared my post if you liked any of my ideas and want to inspire other chronic illness bloggers. Do you have a favourite blog idea on this list or can you add an idea of your own? – If so I would love if you left a comment below.